The Director of Music is always pleased to meet prospective members of the choir to discuss what is involved with joining St Matthew's Choir. There are currently vacancies for both boy and girl choristers, as well as altos, tenors, and basses. 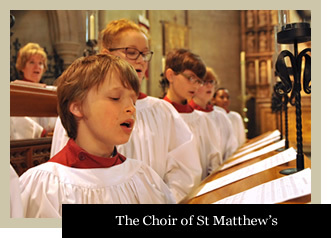 What would being a Chorister at St Matthew’s mean? Continuing a tradition of musical excellence at St Matthew’s which stretches back over 125 years. Singing in the inspiring surroundings of St Matthew’s Church; performing to hundreds of people each weekend. Receiving a free and first-class musical education from professional musicians. Being part of an important team: St Matthew’s Choir is a group of dedicated children and adults who enjoy singing and socialising together. Brilliant opportunities: previous Choristers from St Matthew’s have won the coveted Chorister of the Year award. The choir regularly takes trips to sing in some of the foremost cathedrals in the country, most recently Bristol, Peterborough, and Ely, and has recently undertaken its first international tour to Germany. The choir also sings locally with orchestras and small ensembles. TV and Radio: St Matthew’s Choir has performed on BBC4 and broadcast on local and national radio in recent years. Making friends and having a good time: Choristers are drawn from schools all over Northampton. We meet together to sing, but also enjoy other activities together including bowling, trips to the cinema, sports matches and day trips out of Northampton. Developing important life-skills: members of a choir need excellent self-discipline and concentration, and singing at St Matthew’s teaches children about team work and improves confidence. If you would like to arrange an informal audition, or would like further information, please contact the Director of Music.